Affiliated municipalities and organizations such as Kuroshio Town in Kochi Prefecture, Seto Kenshin Clinic (Kagawa), and Sakura Clinic (Tokushima Prefecture) have been rendering support. They are all part of AMDA’s Platform for the Great Nankai Trough Disaster, which is a disaster-response platform in preparation for the expected Nankai Trough Disaster which is said to hit Japan in the near future. 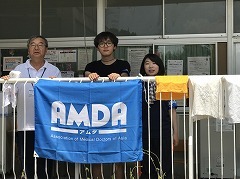 Also, two students from Okayama Prefectural University have been volunteering with AMDA every day since the 24th. On 27th July, 10 repeat patients and 6 new patients received acupuncture treatment for a total of 16 patients. The majority of symptoms were about the hip, shoulders and neck pains. However, it was clear that almost everyone had other pains that they didn’t show. Due to various factors such as the lengthy evacuation period, the incoming typhoon, and general anxiety about the future, a large majority of the evacuees have been having trouble sleeping. As a result of all of this, there are some who are losing their will. If nothing is done about this, it is feared that the stress and exhaustion will continue to just build up. AMDA feels that acupuncture treatment is not just for physical relief, but also as a means of mental care. We would like to encourage evacuees who are suffering to make use of AMDA’s Disaster Acupuncture program and show them that acupuncture is effective in dealing with body pain, fatigue and mental care. 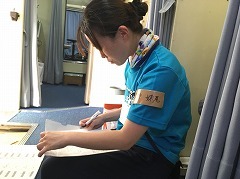 On 27th July, two student volunteers from Okayama Prefectural University were in charge of providing footbaths to the evacuees. Including other staff members, they gave footbaths to 8 people. During the footbaths, they talked with the evacuees to try to understand their feelings. As the typhoon approaches, some people do not have internet access, and some don’t even have the ability to move to one of the televisions set up in the school. Such people are feeling very anxious about the coming typhoon without a means of obtaining information. In addition, there are some who have trouble sleeping through fear of disturbing people with their snoring, and some whose legs are swollen due to a lack of exercise. They want to exercise but cannot due to the pain. There are also some who, even though their own houses were affected by the floods, wanted to help as volunteers as there weren’t enough sent by the local government. However, through talking with the evacuees during the footbaths, they were able to send them off with smiles on their faces. Even further, they were able to convince those who were too scared of acupuncture to give it a try. As of 27th July, there were 38 people from 18 families living at Sunwork Soja. On this day, one public health nurse and coordinator, both dispatched by AMDA, joined local public health nurses to provide medical and health support to the evacuees. Including taking one elderly evacuee to a dentist and another with an irregular pulse to see a doctor, the team dealt with seven evacuees, providing health check-ups, health advice and assistance. Furthermore, the team continued to get evacuees to join in with exercises and teaching them about hygiene in an attempt to maintain the evacuees’ health. What’s more, the AMDA Disaster Acupuncture Team provided acupuncture treatment to two people in the morning. Then, the acupuncturist introduced patients who he deemed of particular concern to the public health nurse, and the team was able to provide well-rounded health support. AMDA dispatched a nurse to Mabi Community Center Sono Branch and worked with the staff there to look after 9 elderly evacuees. In the morning of the 26th, they checked the evacuees’ vitals and assisted them with taking baths. On 27th, they went with them for a walk in the morning and made paper aeroplanes with them during their recreation time. Depending on the day, they assist the evacuees going to the toilet, prepare their dinner and generally take care of them. AMDA also plans to dispatch a nurse in August.